Step away from the syrup! 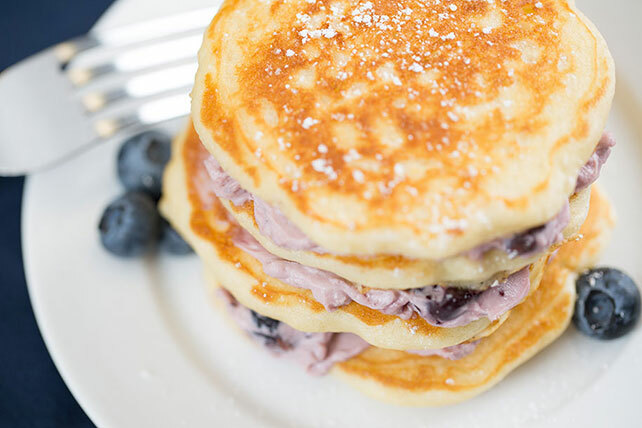 You simply must try these homemade buttermilk-style pancakes with this blueberry cream cheese spread. Mix milk and vinegar in medium bowl; let stand 2 min. Whisk in egg. Combine next 5 ingredients in large bowl. Add milk mixture and butter; mix well. Stack 3 pancakes on each of 4 serving plates, spreading 2 tsp. cream cheese spread between each layer. Cover with remaining pancakes; sprinkle with powdered sugar. Serve with your favorite cut-up fresh fruit.